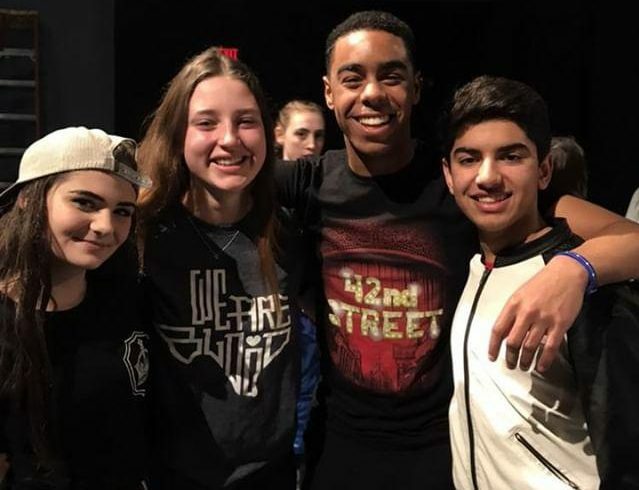 In McCallum's theatre department, it is tradition that before every shows closing performance, the cast and crew gathers to celebrate the participating seniors and have them each give a small speech. In this photo, Moore stands alongside her peers, juniors Lilah Guargna, Owen Scales, and Toshaan Arora just after giving her final speech at McCallum. The Shield: Now that the show has closed, was it all worth it? All the sacrifices, stress, hard work and lower fourth six weeks grades? Zora Moore-Thoms: It was super hard and stressful especially during a short six weeks. But getting to do a final musical with all my friends was really fun, and rewarding. So yes it was worth it but only once opening night hit and we go to hear the audience cheering and everything! TS: Is there one moment where you felt, yep this is as good as it gets? ZMT: The only time I felt like that was opening night when the curtain rose for the first time and everyone cheered! TS: Other than the short grading period, why was this one so hard? ZMT: It was such a huge show, with all the things flying in, the stairs, all the costume changes…And the directors were drilling us really hard with constant notes so that added a lot of stress. 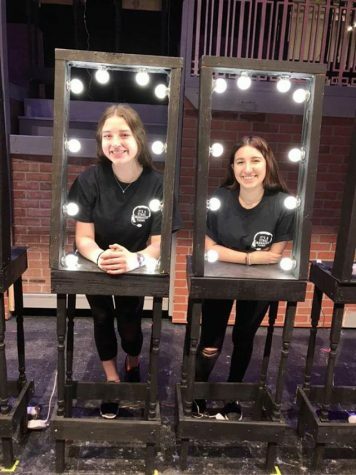 Moore and her Assistant Stage Manager, senior Ramona Sever pose on two of the twenty vanities used for the 42nd Street number, “Every Situation Has A Sunny Side”. The Shield: And a lot of the stress I imagine has to fall on the stage manager, right? How did you handle it? ZMT: This is my fifth show stage managing at McCallum so I’ve had a lot of practice. A lot of the time it’s just learning not to take it personally when people get mad at you or yell at you. I also vent a lot a lot to my mom especially after long rehearsals just to get the stress off of my chest. TS: Let’s hear it for moms! Fifth show? Good God. May I ask what the others were? ZMT: Yes moms are the best! I’ve SM’ed Catch Me if You Can, West Side Story, Moon Over Buffalo, Animal Farm and this show. TS: Is there anything in particular that makes you the most proud to be stage manager of a musical that so many people have loved? ZMT: Yes! It’s really awesome when people come see it and I get to hear how much they loved it! And especially after this show I had multiple people come up to me after the show saying how much they loved it and it makes everything feel so so worth it. TS: What is something important or memorable about the experience that most people don’t know about the show? 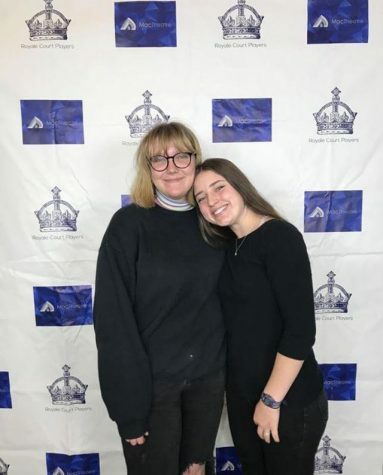 After the 42nd Street performance, Moore and junior lighting designer Zoe Griffith pose in front of the MacTheatre photo backdrop. Griffith and Moore are apart of the small group of technicians with specialties that have them work from the booths during the performances. In theatre, the booth is arguably one of the most stressful places to be during a show. ZMT: There are so many things that are unique to McCallum shows, good show, going to Amy’s Ice Cream the first day of the show, and going to central market after strike on closing night which makes it all come to a nice ending with everyone sitting on the patio eating and talking about how fun (and sometimes super insane) the show was. TS: What’s next for you? No. 6? ZMT: I’m going to Western State in Colorado with a pre-law emphasis, majoring in politics and government and history and minoring in Spanish language! TS: Before I let you go is there anything you would like to add about the show that I didn’t ask you? ZMT: Just that I’ve learned so much! And I’m very grateful for the opportunity even with the high highs and low lows.